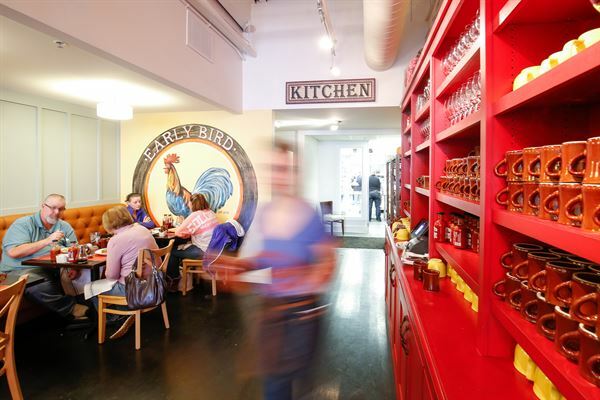 Early Bird is a pioneer in the hospitality industry bringing a world-class chef run and operated food establishment to Colorado, offering big city amenities in the comfort of the suburbs. Early Bird provides fresh, creative, and quality food and beverage executed flawlessly; delivered in an exceptional yet welcoming environment. Our Outdoor patio is large and set up for the perfect outdoor event. It is partially shaded to keep guests cool in warmer months and we have heaters for chillier days or nights. Tucked in the corner of the beautifuyl Landmark shopping center, a perfect place to hold your outdoor party. Utilize the entire restaurant or the bistro area for after hours events and parties. Our space holds 116 guests with 3 different areas to mingle. We have the main dining room, bistro area and private dining room where guests can socialize, dance and have fun. Our food is high quality and locally renowned as well as our drinks and coffees are top notch. Atmosphere/Decor: Modern Country with soft comfortable colors and accents. Special Features: We are a locally owned, chef driven restaurant with decades of experience in the hospitality industry serving guests in some of the highest quality hotels and restaurants in Denver and around the world. A Beautifully appointed private room that seats 24 comfortably. The room is equipped with a flat screen monitor for easy and clear presentations. The Room is closed off from the rest of the restaurant and will have attentive service by our staff. Its a perfect venue for a business meeting, sales pitch, employee party, baby shower, bachelorette brunch, etc. Special Features: The room has banquette style seating with movable tables and chairs to customize the look and feel of your event.